LankaWeb – JHU CRUMBLING UNDER PRESSURE AND WILL IT BE DECIMATED? JHU CRUMBLING UNDER PRESSURE AND WILL IT BE DECIMATED? The decision of President Maithreepala Sirisena to grant nomination from the SLFP and UPFA to President Mahinda Rajapakse has further marginalised the Sinhala minor political parties in Sri Lanka, specifically the JHU. The JHU strongman Mr Patali Champaka Ranawaka has suddenly got a high voltage electrical shock. The crisis within the JHU is continuing. Originally formed as “Sinhala Urumaya” and contested as a single unit in 2005 general election, securing 5.97% of the votes or securing 9 seats out of 225 in the house of representatives. Subsequently it contested under UPFA. At the initial stage of the formation of Sinhala Urumaya, there was a key factor for winning 5.97% at the election. It was the sudden death of Gangodawila Soma Thero, one of most respected, religious Buddhist Monks in Sri Lanka in modern history. Venerable Soma Thero made an emotional speech in Kandy few days before his untimely death. He said “There is a conspiracy to murder me. If my murder can awake Sinhalaya, I am happy to die. After my death, there will be another team of monks to contest the elections. Please help them on my behalf“. The death of Venerable Soma Thero was a blessing in disguise for Sinhala Urumaya which had a team of colourful clergy in the island, viz. Kolonnawe Sumangala Thero, Uduwe Dhammaloka Thero, Ellawela Medhananda Thero, Dr. Omalpe Sobhitha Thero, and Athuraliye Ratana Thero. Patali Champaka was an unknown quantity ( yet to complete requirements for the full professional membership of the Institute of Electrical Engineers in Sri Lanka) was a potential future leader. He started his career in politics with the JVP, and then formed Jathika Chinthana Foundation which created political uprising in the country to some extent. Excited by the emergence of a new boy in the Town, the UNP government arrested Patali and detained him. After the release he then formed Janatha Mithuro, before joining Sinhala Urumaya. Now there is no more Soma Thero factor. President Mahinda Rajapakse removed Patali Champaka Ranawaka from the cabinet, mainly based on unfavourable reports received from the management and the workers of the Ceylon Electricity Board against the Minster Patali. It is alleged that he is a big headed man with a big mouth unable to work with others and a very poor listener. During last Presidential Election he went behind the Cocktail Prime Minister Mr Ranil Wickremasinghe. He did promise a new formula for Fuel Pricing within 30 days, now reduced to a level of a caretaker Minister his promised formula has still not been made public. Mr Rauf Hakeen recently complained of a certain Minister of UPFA aspiring to be future President, constantly obstructing the minority views. He was referring to none other than Patali. JHU has lost one of potential leaders, viz. Mr Udaya Gammanpila. JHU has now changed its name to United Governance National Front and had left the UPFA. Ven. Athuraliya Rathna Thero is on the fence right at this moment. We challenge the JHU or the new UGNF to contest alone at the upcoming general election as they did in 2005. Can they secure 5.97% of votes now in 2015? We’ve to be intelligent here not just bashing your opponents childishly; we want MR to win handsomely but we know it is only Sinhala Buddhists who will take the challenge up. Any division of Sinhala Buddhist base is detrimental not only by numbers but projecting ourselves as saviours of our nation when another Buddhist group is going against MR. Rather than continuing to sling mud at JHU, the strategists in the MR camp should attempt to rope in JHU & BBS. As you say Hakeem was denied having his own way of manipulating 20th Amendment among spineless other Sinhala ministers by Champika only, that is great from our perspective & should give credit to him than mud. I hope, as MR admitted himself,wrongs would be corrected, he will offer olive branch to JHU. Forgive & forget, politicians have strange bedfellows, no surprise. Do not forget JHU tried its best to convince MR of changes & commissions (which MR was against at that time but now implemented with his own approval) before they deserted MR. I request MR camp to act wisely & not go on some people’s bandwagon.MR will win only with Sinhala Buddhists votes. මේ හීරලුවා සහ ගනගෙඩියා සින්හල හා බොදුබව විකුනාගෙන කාපු උන්. උන්ට ඉන්දියන් ජඩයින්ගේ සල්ලිවලට වඩා දෙයක් නැත. මුනුත්, බොදු බූරු, සේනාව වගේ තව එවුනුත්, බන්ඩාරනායක හැතිකරයත්, අද යූ ඇන් පී හැත්තත් එකම වල්ලේ පොල්ය. සින්හලයින් මොඩයන් කිරීම හා සින්හලත් බොදුවත් ඉන්දියන් ජඩයන්ට විකුනාගෙන කෑමය මුන්ගේ හකියාව. Singhalese are DIVIDED but Tamils and Muslims are NOT. It is NOT intelligent to FURHTER DIVIDE Singhalese. At the election the party that wins MOST votes from a district wins a BONUS seat. IF JHU contests separately UNP will win it in districts that it should NOT. BUT IF JHU is adamant they CANNOT join MR, then JHU should be DECIMATED. The preferred option will be for MR team to register its own political vehicle instead of hiring taxis. If we praise the President MS now, we might regret it in a few days time. 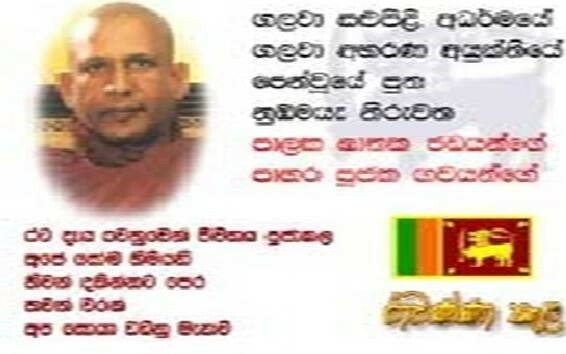 JHU is not a formidable Sinhala Buddhist front, as most of the respected men who pioneered the movement have left JHU, such as Late Mr S L Gunasekera, Tilak Karunaratne, Prof. Nalin de Silva etc. Unlike in January 2015, Buddhist Clergy’s are now with MR. In January 2015 MR secured 5.8m by contesting alone, since then he has gained sufficient ground support. None of the charges levelled against MR had been proved during past 6 months. The public will deliver a sound judgement. The public are not as informed as us. They watch TV to get news. MOST TV stations support UNP. MR need the support of EVERY POSSIBLE party to win this election. INCLUDING JHU. IF JHU wants to play dumb and will not join MR, THEN lets bash it. We should hold fire UNTIL nominations CLOSE on July 15. We should also get KARUNA, PILLAYAN, TMVP, DOUGLAS, RAZEEK GROUP, etc. Their voters also count. “We should also get KARUNA, PILLAYAN, TMVP, DOUGLAS, RAZEEK GROUP, etc.” – yeah LTTE and Jihad votes. Get them too and start dancing to their tune !